Area business manager Emma King, store manager Helen West and store associate Zoe Spencer (centre) with volunteers Jade Ballard, Pauline Centa and Emma Geddes. 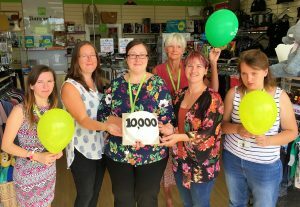 Hardworking fundraisers at a Melksham charity shop are celebrating after receiving 10,000 bags of donations. Barnardo’s opened a new store on Verbena Court, behind the Water Meadow restaurant, in spring 2016. The team has since raised tens of thousands of pounds to support the charity’s work with some of the UK’s most vulnerable children and young people. Staff and volunteers celebrated the major milestone by cutting a specially-decorated cake on Wednesday 25th July. The Barnardo’s store is managed by Helen West and store associate Zoe Spencer, who are supported by a team of 11 volunteers aged from 19 to 73 years old. Since opening, local volunteers have donated more than 1,200 hours of their own time to help with sorting stock, steaming clothes, arranging displays and serving customers. They have also signed up more than 2,000 donors for Gift Aid, which allows the charity to raise additional money by reclaiming the tax on gifts. Helen, who recently celebrated her first year in charge said, “We wanted to arrange a special thank you for all of the team who’ve worked so hard to make this store such an amazing success. “We’ve only been open for a couple of years so it’s fantastic that we’ve already received more than 10,000 bags of donations from the local community. “Every day is different as we never know what we’re going to receive. We once discovered potatoes at the bottom of a bag of donations, but people have also given designer handbags and gold jewellery. That’s part of the charm of charity shops – they can be a treasure trove of surprises! The Barnardo’s store is open Monday-Saturday from 9am-5pm and on Sundays from 10am-4pm. The team always welcome donations of good-quality clothes, books, toys, games, CDs, DVDs, bric-a-brac and accessories, as well as offers of help from potential volunteers. Call (01225) 436806.